STONE SOUR guitarist Josh Rand says that he sought out treatment for "an alcohol and Xanax dependency" earlier in the year, forcing him to sit out the band's last tour. 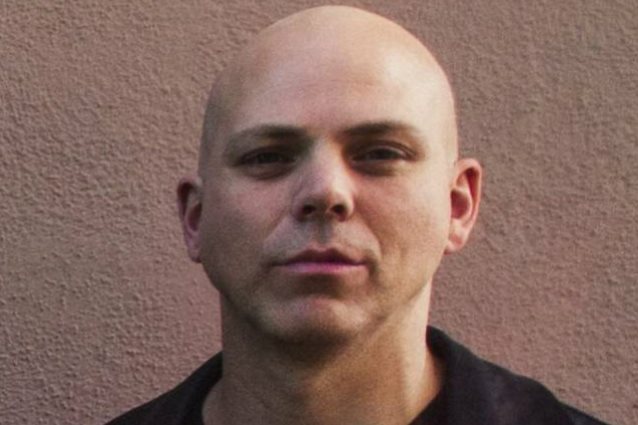 The guitarist most recently performed with STONE SOUR on the ShipRocked cruise in January before it was announced that he had entered treatment for unspecified issues. STONE SOUR enlisted a temporary replacement for its Canadian tour, which started at the end of that same month in British Columbia. Two months ago, STONE SOUR singer Corey Taylor revealed that Rand would rejoin his bandmates on the road on April 27 at the Welcome To Rockville festival in Jacksonville, Florida. Earlier today (Sunday, April 15), Josh released a statement thanking STONE SOUR fans for their support and explaining some of the issues that led to him having to take a break from the road. "As many of you may already know, in January of this year I made the difficult decision to step away from the Canadian leg of the STONE SOUR tour," Rand said in the statement. "I hit a personal breaking point and it was imperative that I address it. My high anxiety and desire to feel comfortable in my own skin over the years led to an alcohol and Xanax dependency. That, along with aggression issues, made me feel miserable and I just could not continue to live that way. Thankfully, with the support of my band, family, and friends I was able to come home and seek help. Now (three months later) I’m doing well, but still a work in progress." He added: "I want to sincerely thank all of you for your thoughts, prayers, and positive words. It means a lot to me." Back in February, Corey told the Regina rock radio station 104.9 The Wolf that Josh is more than just a bandmate to him. "We've been best friends since we were 15 years old — I mean, we go way back," he said. "For me, it's not just the worry of my cohort, my partner, my songwriting guy, my lead guitarist, it's about worrying about my friend, my brother, somebody who let me sleep on his floor when I was homeless," he said. "So, for me, that's the biggest thing — worrying about him. But he seems to be doing really, really well. And we just support him as much as we absolutely can. And when it comes to being a friend, that's all you really can do — just be there for them. The best way to be a friend is just to stay right where you are and just let somebody lean against you if they need it, and that's what we're trying to do." STONE SOUR is touring in support of its sixth studio effort, "Hydrograd", which came out last June and features the chart-topping rock radio hit "Song #3". STONE SOUR will support Ozzy Osbourne on the initial North American leg of the legendary vocalist's "No More Tours 2" tour, which kicks off August 30 in Allentown, Pennsylvania.